Product prices and availability are accurate as of 2019-04-23 13:42:50 UTC and are subject to change. Any price and availability information displayed on http://www.amazon.com/ at the time of purchase will apply to the purchase of this product. 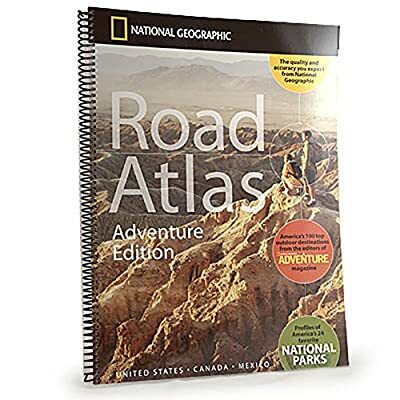 Get there with National Geographic's Road Atlas, Adventure Edition. Updated road maps of all 50 US states, Canada, and Mexico make it easier to find your way. Special section features 100 top outdoor destinations, plus profiles of 24 of America's favorite National Parks. Shows thoroughfares, secondary roads, scenic routes, mileage markers, recreation areas, and more. Detailed downtown city maps and metropolitan area inserts. Spiral bound, 144 pages. Durable plastic outer shell protects the atlas from the rigors of car travel. Measures 11 x 15 in..